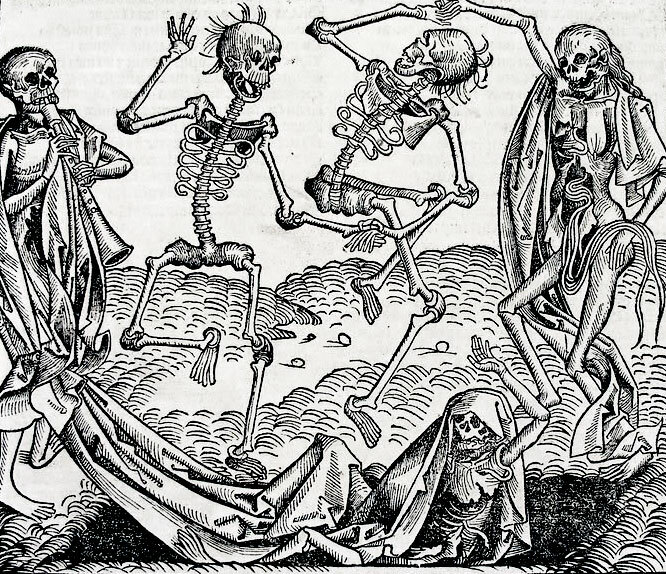 The ‘Black Death’ or ‘Great Pestilence’ swept through Europe between around 1346–1353, where it eventually killed between 30-60% of the population – maybe 25 million people, though some historians estimate twice that figure. The disease originated ‘somewhere in the east’ and arrived in southern or south western England sometime in the spring or summer of 1348. Some sources say that plague got into the country via the port of Bristol, others specify the Melcombe Regis dock area of Weymouth in Dorset; in reality, it probably arrived in various locations on ships carrying goods or returning soldiers from France. From the south, infection spread rapidly north and east, reaching London, East Anglia, the Midlands, Wales and the North. The Scots, maybe keen to capitalise on England’s misfortune, raided Durham – which probably assisted the spread of contagion to Scotland, though doubtless it would have got there in its own good time anyway. Infection crossed the water to Ireland. By 1353, it had reached Scandinavia and Russia. It is thought to have begun to subside in Britain, where it is reckoned to have eventually killed about a third of the population – perhaps as many as 2 million people – from about 1350. This is a truly hideous statistic. Think about it: if that happened today, it would be equivalent to about 19.8 million people dying in Great Britain alone, reducing the population to roughly what it was 100 years’ ago. Human tragedy aside, how would we cope with that? The emergency services and civil authorities would be overwhelmed – probably similar to the situation in the event of a biological attack. And what would the consequential effects be? In the worst hit areas of Britain 750 years’ ago, people simply did not know what to do. It could, and did, affect everyone: men, women, young, old, ruling class, clergy and peasants. Society was as dislocated as would be the case today. And the effects were profound. Some places simply disappeared from the map. Severe labour shortages resulted in higher wages and inflation. But, then, social mobility improved. As less land could be cultivated, sheep farming increased which boosted the wool and cloth trades. People must have been terrified, though. Some, if they could, simply tried to run away from it – possibly the only remedy at the time. Of course, folk wanted to blame someone, or something, for the dreadful devastation of their communities. Some apparently blamed Jews – though they had been expelled from England by Edward I a generation earlier – and other minorities, who were often violently persecuted. Some blamed the Church, possibly paving the way for future reforms. The effects of the plague may well have contributed to the breaking down of feudal barriers and a more questioning attitude, increasing the potential for unrest and, perhaps, revolt. 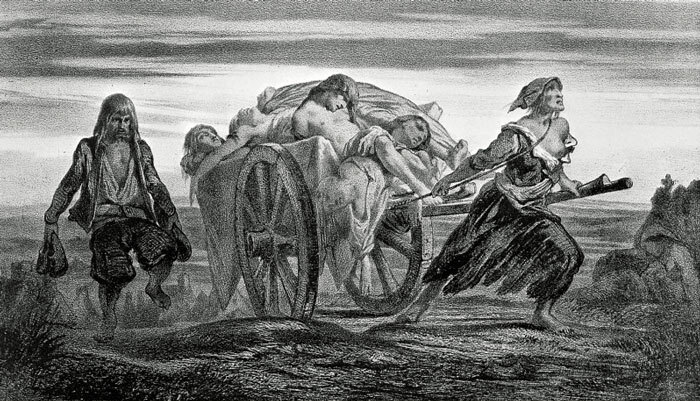 Further outbreaks of plague occurred in Britain in later years, particularly in 1361 and 1374. The last major plague eruption in Britain was the Great Plague of London in 1665 – which also affected other parts of the country. In Britain, ‘the plague’ is a term which usually refers to what people understand to be the bubonic plague, Black Death, or Great Pestilence. It is a disease that primarily affects the black, or ship, rat, Rattus rattus via infected fleas. Having taken in the bacteria Yersinia Pestis when biting an infected rat, the flea finds it is unable to ingest and, starving, embarks on a feeding spree, attempting to satiate its hunger. It will feed on any convenient victim – another rat, a human or other mammal, vomiting blood containing the bacteria as it does so, in an attempt to clear its blocked stomach, and passing on Yersinia Pestis in the process. Bubonic plague results from an infection of the lymph nodes, causing painful suppurating bloody-black sores – particularly in the armpits and groin area. Other symptoms include severe pain, fever and gangrene in the extremities (ie toes, fingers, nose). There are two other possible developments. Septicaemic plague is caused when the infection spreads through the body: it ultimately inhibits blood coagulation and is usually fatal because sufferers more or less bleed to death internally. 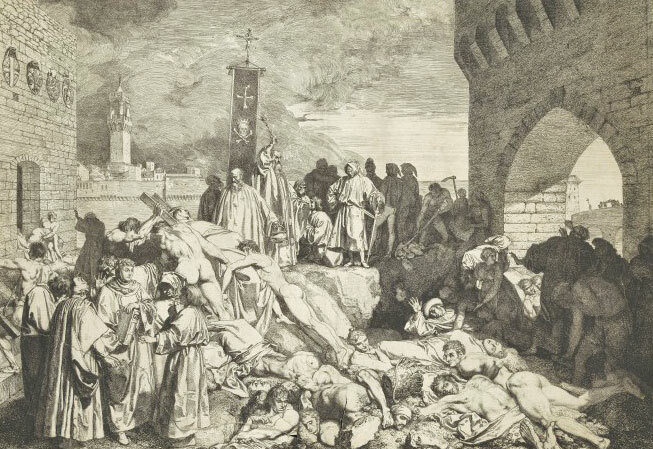 A third form of the plague is pneumonic plague, which is highly aggressive, contagious and almost always fatal. Settling in the lungs, the bacteria cause them to liquefy. Pneumonic plague does not need the assistance of rodents or fleas to spread; it is caught by direct and indirect contact as well as via droplets coughed or sneezed by its dying victims. Some people must be immune, but for most of us anything closer than 12 feet can be deadly. Cases of the plague still occur in some countries today, including the USA. There was an outbreak in India in the 1990s.